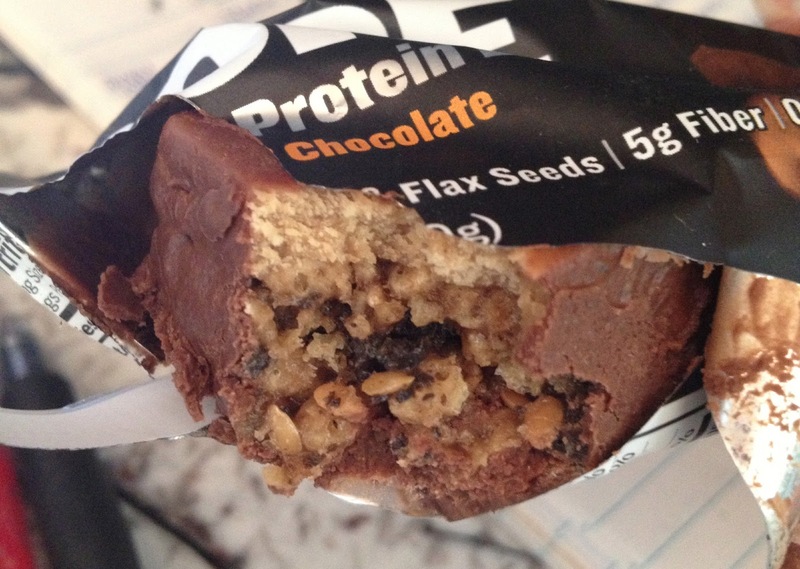 VMfitness: July Goals, Workouts, Protein "Poptart" & Probar Core Review & Discount! 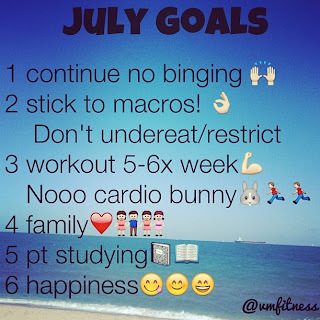 July Goals, Workouts, Protein "Poptart" & Probar Core Review & Discount! Wahoooo new Month new Goals!! I loved seeing all your goals on the #vmfitjuly hashtag on instagram! They're awesome and you'll all REACH THEM! You got it FITFAM! If you didn't know, I wasn't able to workout from the end of April - now! But now that I've been cleared to work out again, MANNN am I excited! Since I don't have a gym membership and can't lift as heavy as I'm used to [still recovering from surgeries] I'll be doing at home workouts with my dumbbells and other weights I have here! I'll be focusing on total body strength and cardio exercises, such as plyos mixed with weights. I hate endless cardio sessions, so I'll be doing high intensity cardio mixed with periods of rest, HIIT circuits! 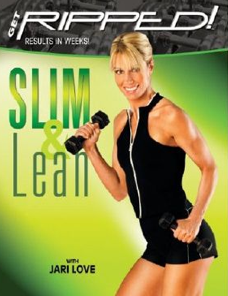 I'll be doing workouts from the Nike Training Club app as well as a total body workout DVD: Jari Love Slim and Lean dvd I bought a while ago! Focuses on high rep low weight, and even though I like doing low rep heavy weight more, I unfortunately can't lift too heavy right now, so this is what I'll be going with! I'm trying not to go tooo crazy on cardio because I don't want to be a cardio bunny! AND if I plateau, THEN I'll increase intensity of my workouts. But for right now, I'll just start off with this! Remember, you don't want to go CRAZY right in the beginning, with overtraining or cutting calories too low! Because when your progress stalls, what will you do? Go MORE intense? Cut calories even LOWER? No. Start off slow and steady! Slow and steady wins healthy maintainable lifestyle race! 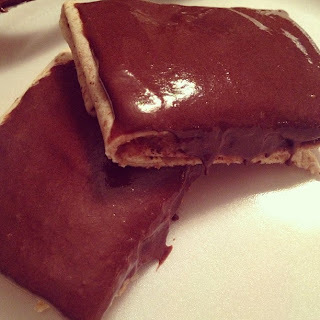 After seeing all of @Pbeechie's poptarts, I decided to make my own! If you want to see her recipes, you can go to this link and check them out! Kim, Pbeechie, recommends using a panini griller but I didn't have one! I simple laid out the tortilla, plopped and spread the peanut butter in the middle, put a bit of the protein frosting on top of the peanut butter, then folded the left and right sides of the tortilla in, and the top and bottom to make a rectangle. Then I used a bit of the protein frosting as "glue" and put them in the flap area to hold the top and bottom ontp the poptart. Confused yet? So just lay the poptart flap sides down! Then frost with the protein frosting. And awesome package from Probar was at my door this morning! They have a few different kinds of bars, check them out HERE. 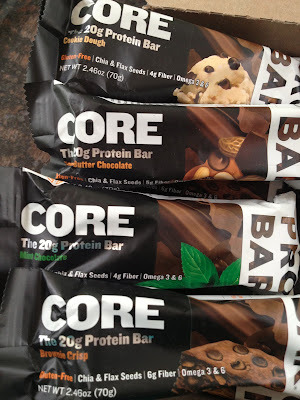 Today I'll be reviewing their CORE line! 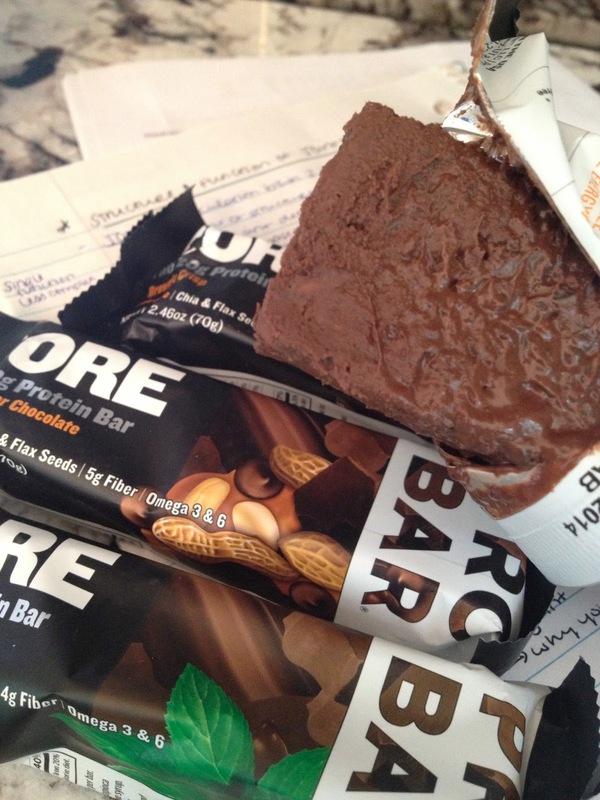 PROBAR packed 20 grams of plant protein and plenty of real, natural ingredients into this bar. Contains a chia and flax blend providing Omega 3 and 6. 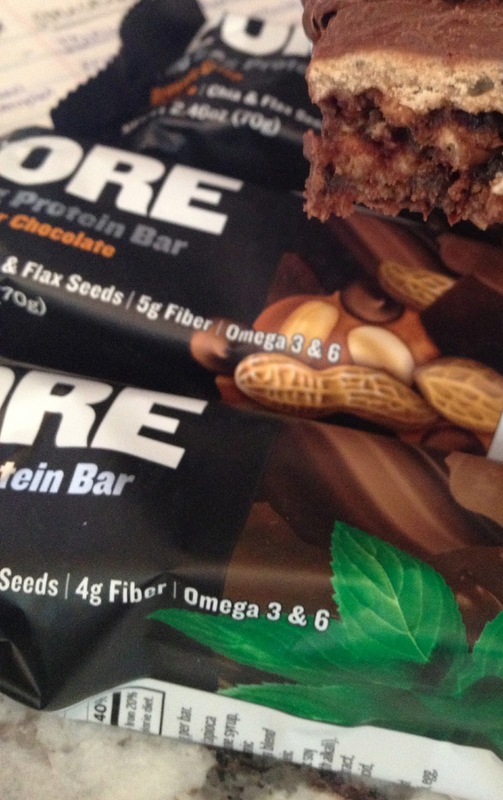 With flavors like Cookie Dough, Peanut Butter Chocolate, Mint Chocolate and Brownie Crisp, CORE will be one of the best-tasting protein bars you'll ever eat. Vegan. Certified Gluten-Free. All sugar alcohols removed. I was so eager to open up these bars, but after sitting at my front door in the summer heat, they were a little melty :P But still delicious! In the layer below the soy crisps is where the delicious cookie dough flavor is. As you can see in the picture to the right! It tasted sweet, crunchy, and delicious! Same crispy crunchiness from the soy crisps. Plus a great peanut butter taste! Can you seeee the flavor from this close up pic?! I can. It was my favorite flavor of course because I'm addicted to anything peanut butter. It's also made of defatted peanut flour! This had the classic mint chocolate chip flavor. For some reason I'm not a huge fan of mint flavored things... strange I know! But this had a true taste similar to thin mints or chocolate mint ice cream! Very thick chocolatey taste! And combined with the crispy crunch of the soy made it a really great bar! Real thick and chocolatey fudge taste! These bars are packed with nutrition, and are also pretty high in calories compared to other bars, which means you could eat some and save the rest for later, or eat the whole bar as a small meal or snack to energize you throughout the day! Thank you so much Probar for sending me these high protein yummy treats! And don't forget to like them on facebook as well! 40% discount off your first order! Simply go to HERE and enter the discount code "BLOGGER" ! Easy-to-digest energy gummies that come from recognizable real food ingredients and provide clean burning fuel for high-intensity workouts and races. Certified USDA organic, Vitamin B-rich, caffeinated with yerba-mate extract, which provides a mild stimulating effect for your muscles and mind. BOLT is infused with apple, acai, blueberry and pomegranate powders to create a delicious all-natural flavor. Flavors include: Berry Blast, Orange, Raspberry, and Strawberry. Zero added nasty, weird stuff. The original meal-replacement bar now comes in four new and delicious flavors: Oatmeal Raisin, Mint Chocolate, Chocolate Coconut and Superberry & Greens. These meal-replacement bars are guaranteed to satisfy your hunger and deliver plenty of all-natural, nutritionally based energy. Certified Organic, non-GMO, vegan, and rich in raw ingredients. Perhaps most notable, The Superberry & Greens combines hard-to-find super-greens like Wheat Grass, Chlorella, Maca, and Spirulina with berries such as Goji, Raspberry, Blueberry and Acerola Cherries to deliver an incredible antioxidant rich super-food snack. Superberry and Greens is also the first bar on the market to come with an active pro-biotic to ensure smooth digestion.